Taversoe Tuick can be though of as the cairn that started Rousay's journey towards the archaeological prominence it holds today. Lt General Sir Frederick William Traill Burroughs of nearby Trumland House was a hated landlord who sought to dispossess his tenants long after such activities had ceased to be regarded as acceptable by the establishment of the day. 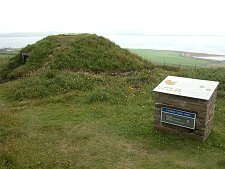 But his efforts to construct a viewpoint for his wife led to the discovery of the Taversoe Tuick Cairn: and the rest is history. Taversoe Tuick is signposted from a layby on the road that encircles Rousay, only half a mile west of Trumland Pier. It is reached by a short uphill walk across the field above the road. The design of the cairn is highly unusual, with only one other like it known to have existed, on Eday. It is, in effect, a two-storey circular cairn. 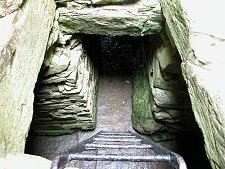 The two layers of the interior were inaccessible from one another (today they are connected by a hatch in the floor of the upper tomb and a short iron ladder). 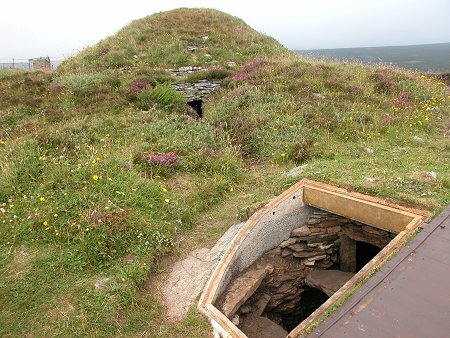 The upper chamber had its entrance on the north side of the cairn, while the lower chamber was entered via a longer passage from the southern side of the cairn. 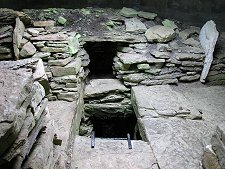 To add to the complexity, a third, miniature chamber was constructed on the southern edge of the cairn, near the entrance to the lower chamber. No one knows the reason for the complexity of the design, though it does seem likely that the whole cairn was designed and built at the same time. Visitors today enter via the grille door to the upper chamber, covered by its protective concrete dome, and can descend into the lower chamber for a sense of the rather claustrophobic space and the unappealing tunnel leading out from it. 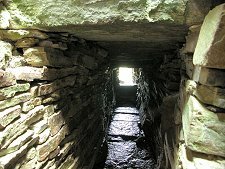 The third smaller chamber can be viewed by opening a very heavy trap door near the main cairn.